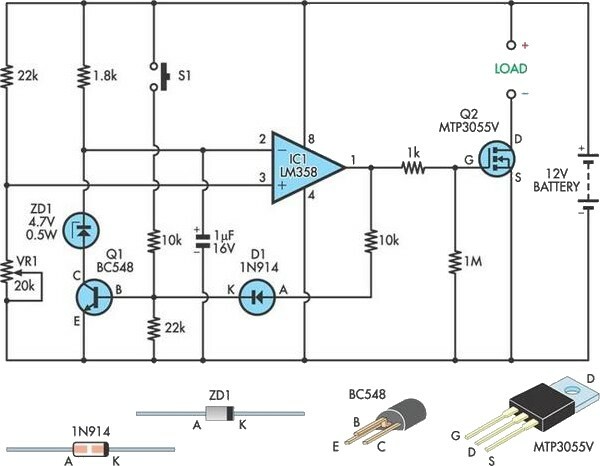 This simple circuit protects an SLA battery from over-discharge by disconnecting the load when the terminal voltage drops below a preset level. In operation, a sample of the battery voltage is derived from the 22kΩ resistor and 20kΩ trimpot divider. This is applied to the non-inverting input (pin 3) of IC1, where it is compared with a reference voltage on the inverting input (pin 2). When the sampled battery voltage falls below the reference voltage, IC1’s output (pin 1) swings towards ground, switching Mosfet Q2 off and disconnecting the load from the battery. The reference voltage is derived from a 4.7V zener diode (ZD1), which is connected to ground via the collector-emitter circuit of Q1 (ie, when Q1 is on). However, when the op amp’s output is driven low, Q1 is switched off, causing the non-inverting input to rise towards the full battery voltage. This greatly reinforces the switching action, latching the circuit in the "off" state until the battery is recharged and the reset switch (S1) pressed. The Mosfet used for Q2 should be selected to suit the intended application. The circuit could also drive a relay simply by connecting the coil across the "load" terminals. As is usual practice, a diode should be connected across the relay coil to limit back-EMF spikes.